As a reader, I am ultrasensitive to point-of-view shifts that are confusing, break the flow of the story or are an easy out for the writer. As a writer, I have to be hyper alert to making the mistake that can slip in if I get lazy as I pen and edit my stories. Point of view is the narrator’s position in relation to the story he or she is telling. The narrator can be a character in the story or an outside observer. The point of view can be subjective, describing one or more character’s thoughts and emotions. Or it can be objective by being entirely omniscient and all knowing or omniscient limited, narrowed to the perspective of a single character. In first person, the narrator is the main or a secondary character telling the story. The “I” (or “we”) observes and reflects on the main events of the story from the beginning through the end. Using first person is a way to reveal the narrator’s unspoken thoughts or internal musings, adding depth to the external events that occur. These thoughts can be directly expressed or coupled with action, letting the reader interpret that deeper level of the story. Second person is the least common voice, while third person is the most common. Point of view can become annoying when a writer switches among characters in the same chapter or, in some cases, the same paragraph. I have encountered this with genre writers who are on their third or fourth book and obviously are under contract to crank out another book. You know what I mean? The writer making this mistake is moving too quickly through the scene, bouncing from character to character without developing a particular character and how he or she is acting and reacting in a moment of the story. Samantha sniffed, offended at what Sarah had said in the break room, trying to think of what to say in response. Sarah turned her back to microwave her lunch, rolling her eyes at the cupboards. The dishwasher, though the sign said “dirty dishes,” rattled as it cleaned. Here, the viewpoint shifted from Samantha to Sarah to the dishwasher, which was acting independently. It wasn’t being observed by Samantha or Sarah. Point of view is something that should go unnoticed by the reader but becomes part of how they feel the story as they read through the plot. Though it seems so basic to me now, I used to struggle with identifying the theme in the books I read. A definition of theme is that it is the main message of the story or the central idea the writer is expressing. It is what the story really is about and why the story matters. In other words, it is the deeper layer of meaning running through the story’s surface. Theme is the glue that holds together a story. Otherwise, the story consists of this happening and then this and that and lacks that meaning. As an early reader, I identified several “themes” in the text that, for me, added many layers through my interpretation of the unfolding events. But I couldn’t say what the main theme was, such as good versus evil or overcoming some difficulty to achieve success. I couldn’t narrow what I read into a few words, though I could summarize the plot from the beginning through the climax to the end. The same goes with my writing. I just want to tell a story. I come up with character identities and a brief plot outline. It’s not until I start writing and thinking about my story that themes arise, usually more than one. Theme is not just a simple idea fleshed into story; it is how the writer interprets the world. It is how the writer explains what people do as they interact with that world and with each other. The writer doesn’t have to come up with some great revelation about human behavior but simply can offer some insight or comments. The writer can achieve this without being overbearing, preachy or heavy handed. Readers, in turn, interpret the theme, or themes, differently by noticing different aspects of the story. The theme makes them think and ask questions about what they’re reading but also about their own lives. It is the lesson or conclusion that can be drawn from the story that adds value to the greater world. * See Zoey’s blog on the same topic at http://zoeyspaw.wordpress.com/2012/03/18/dog-themed-love/. In my chase of 52 writing topics in 52 weeks, I am pausing on reading as a type of prewriting. At least this is what I tell myself. I am a bibliophile addicted to reading and have to read at least every other day. I can go without reading for one day, but not two in a row. I can give up caffeine easier than books, and when I do – usually when I’m sick in bed or trying to be healthier – I get the withdrawal headaches. I don’t get headaches when I don’t read, but I’ll start plotting how I can get my next reading fix. Like caffeine giving energy, reading is essential to becoming a better writer. It is a way to experience different styles, or ways of using language through word choice, sentence structure and description. The words are absorbed like anything wet into something dry, expanding the dry object so that it has more heft. So will your vocabulary, giving you more options in how you describe the people, places and things of your fictional, or nonfictional, world. Another aspect of reading toward writing is thinking about what you read. This can be done by analyzing the different elements of how the story is put together, looking at the plot, characters, setting and dialogue and the author’s voice. * Does the plot maintain your interest? Are there transitions or does the storyline feel choppy and lack transitions? * Are the major characters realistic? Do the minor characters serve a role in the story without drawing too much attention to their identities? * Does the description of the setting make you feel like you’re there or do you trip over the words, because it’s too flowery and long? * Is the dialogue how people talk without everything spelled out but with underlying meaning and an unspoken understanding between the characters? At first, I used to read just for pleasure, but now I engage in reading analytically, asking what I like about the story elements. If I don’t like a book, I don’t just put it down. I ask why and try to identify if it is the style I dislike, or if it something about the storyline or the character development. As a final note, I think to become a better writer, read on a regular basis. Take your book with you wherever you go. Each journal in this pile has a specific purpose in my writing life. In my quest to find and write about 52 writing topics in 52 weeks, I’m going to veer off course to talk about what I like to call pre-writing. Journaling is a form of writing that isn’t as official as writing drafts for stories or playing with the lines and words of a poem. Like an artist’s sketchpad to practice drawing skills, journaling can be a place to practice and play around with language and ideas. A journal can be used for freewriting, a form of writing that involves writing nonstop for a certain period of time, say five to 10 minutes, without constraint or a specific goal in mind. It can be for capturing snippets of conversation, recording details you observe in your environment and offering a timeout to get you to that space where you are ready to write. 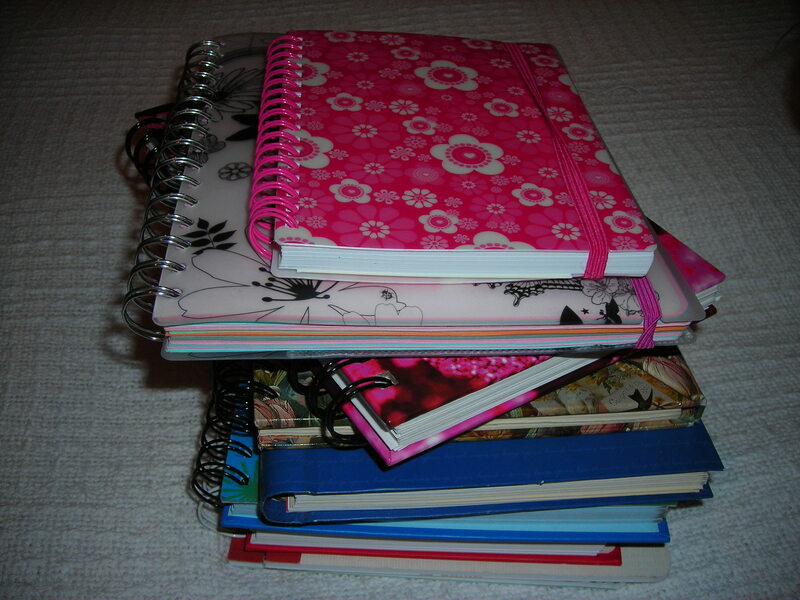 I have nearly a dozen journals, and I cannot live without any of them. I have my diary journal where I write down what I do each day, my responses to the things that annoy and please me and my plans for the next year. I do this every time I start a new journal (usually in June, for some reason) and at the beginning of the new year. I have another journal that I call my play journal. It has different colored sections that I’ve designated for freewriting, book starts, book and story ideas and notes about the writing process. Another of my journals is solely for freewriting because it already has prompts that I can use when I’m blocked. I have a journal for tracking where I send my work. I put exes through the lines when I get rejection letters, turning this journal into one that I don’t like as much as my others. (I gave one of the rejection form letters to my dog and she ripped it up, and quire frankly, I quite enjoyed her slobber marking my disappointment). * Writing exercises you want to try. * Notes from what you’re reading or the things you want to look up later, such as words, phrases and ideas. * Photos of settings and the buildings and places in your story. I’ve found that journaling shouldn’t be a chore and by journaling regularly, ideas come to you for new stories, ways to describe things and even new types of journals.